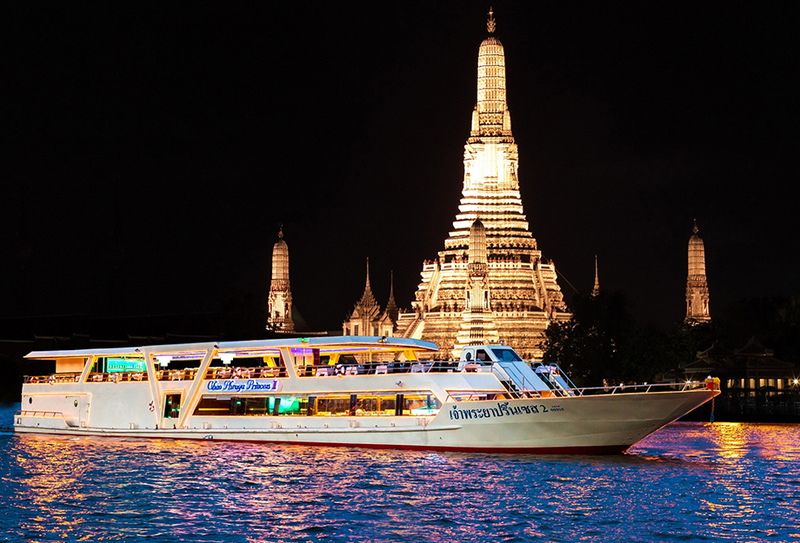 Welcome aboard a two-hour journey on the extravagant Chao Phraya Princess Cruise. Experience luxury and romance throughout your dinner with a night on the water. Each deck has its unique designs. Your dinner includes a wide selection of dishes both Thai-styled and international foods with appetisers, main dishes plus buffet style desserts. Be serenaded while enjoying your dinner by our musicians including saxophonists and singers who will soothe you with soft Pop and Jazz songs in the first hour of your journey. You will have the opportunity to take snapshots of the scenery, famous historical structures and religious monasteries such as the Royal Grand Palace Wat Pra Kaew, Wat Arun (The Temple of the Dawn), Bangkhunprom Palace, Kanlayanamitr Temple and the Rama 8 Bridge along both sides of the river bank. After your dinner, join our talented musicians with an entire hour dancing to fun, energetic and upbeat music. Bring your camera to snap some of the great landmarks along the river bank.